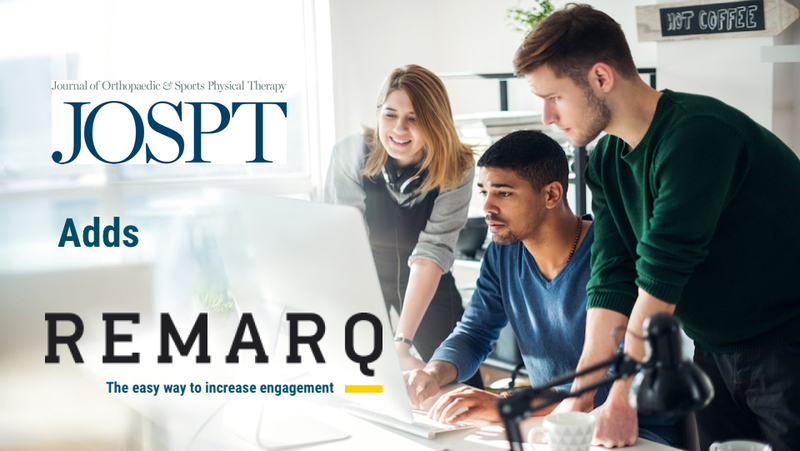 Remarq, the editorial engagement and researcher collaboration tool from RedLink, is now available on the Journal of Orthopaedic and Sports Physical Therapy (JOSPT) website. January 16, 2019, Alexandria, VA and Westborough, MA– The Journal of Orthopaedic & Sports Physical Therapy (JOSPT) is pleased to announce integration of Remarq, the collaboration platform from RedLink, on www.jospt.org. This integration allows JOSPT to offer annotation, commenting, article sharing, and editorial tools to its growing community of subscribers. More than an annotation tool, Remarq gives publishers, editors, and authors tools to build community and engage their audience on the version of record. In the past year, journals that have adopted Remarq have benefitted from measurable increases in engagement of their readers. More information can be found here and here. Now celebrating its 40th anniversary, JOSPT publishes scientifically rigorous, clinically relevant content for physical therapists and professionals in the health care community to advance musculoskeletal and sports-related practice globally. In both a monthly print journal and through its website and social media, JOSPT features the latest evidence-based research and clinical cases in musculoskeletal health, injury, and rehabilitation, including physical therapy, orthopaedics, sports medicine, and biomechanics.